The chickens aren’t the only ones sick of this wintertime weather inconvenience. I’ve been jonesin’ for spring for weeks now. Well, spring and chocolate. I can do something about the chocolate. It turns out, I can do a little something about spring too! Some of my gardening pals egged me on (*snicker*) with their discussion of all the spring bulbs they were buying for forcing. The nursery of choice among these seasoned gardeners was Brent and Becky’s. 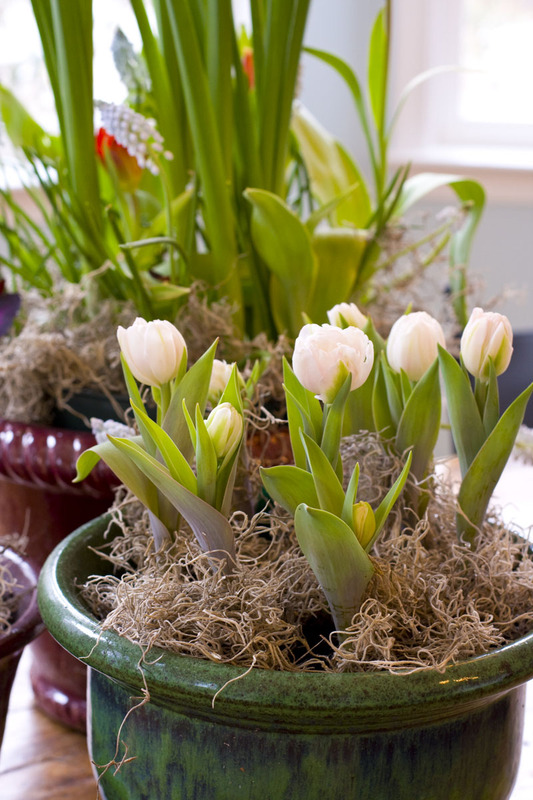 Here’s the Brent and Becky’s winter mix bulbs with narcissus, tulips and small oxalis peaking out around their feet. 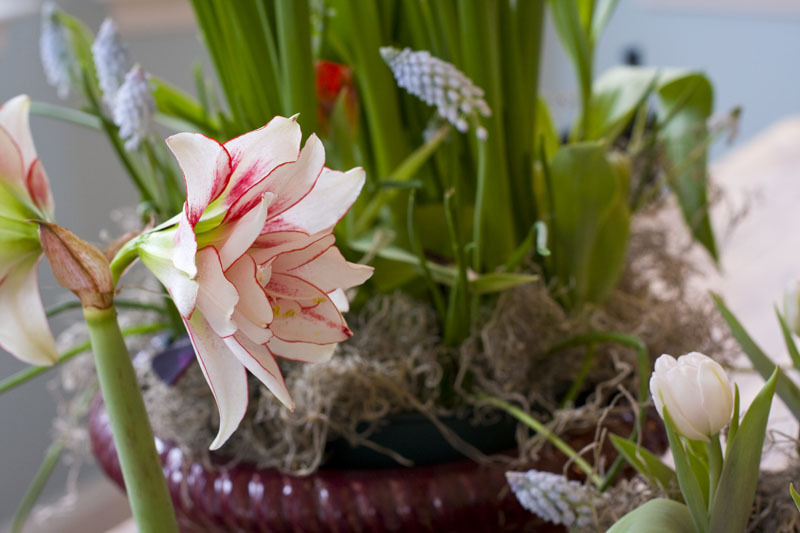 Next to it is the gorgeous Amarylis ‘Elvas’ and the stout little ‘Foxtrot’ tulips. I also have some Princes Irene and ‘Lilac Wonder’ tulips, but they’re not quite ready for their debut. There’s still a lot of winter left here in Southern Maryland. In fact, as I write this it’s snowing. The weather guessers had predicted a couple of inches. Right now it looks like it’s about eight inches and rising. I responded, of course, by ordering seeds. So far I’ve placed a nice, healthy order at Baker Creek Heirloom Seeds and a smallish order at Cook’s Garden. I’m not even closed to finished yet, cause I’m jonesin’ for some summer bulbs. Brent and Becky’s here I come! I am definitely feigning for spring! I can’t wait to plant some new flowers outside.. We just moved in our house in December and I haven’t been able to plant anything. I have my gardening tools READY! I’m trying to convince myself that in a few short weeks it’ll be spring! I do believe there’s a chance of it here but typically we’ll get hit with a late freeze. 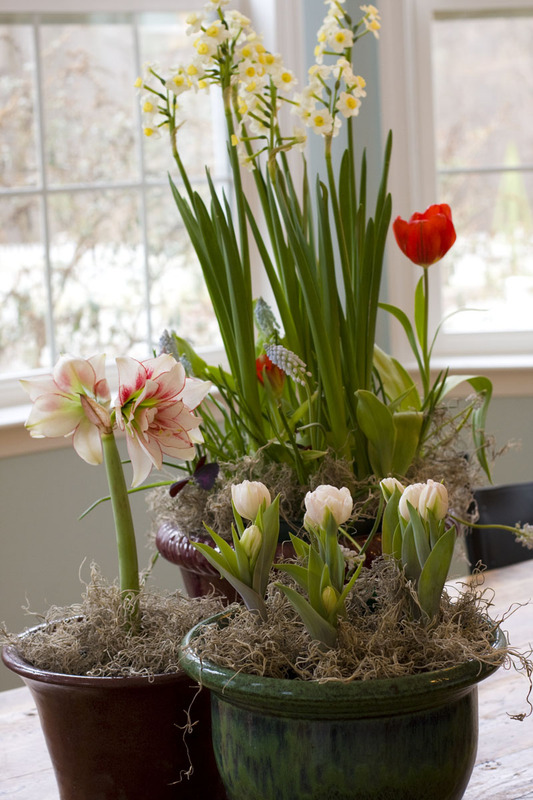 Anyway, bulb forcing seems like a great way to anticipate spring. I especially love your amaryllis. How did you get it so short? Most times mine get very tall. .-= Jean´s last blog ..Gumdrops and Meatballs =-. I’m jonesin’ for spring, too, and it’s not nearly as cold here as in MD! Hawaii is sounding better every day I wake up to gray skies and temperatures in the 40s. Your photos have made me realize I have made a serious mistake with my forced bulbs – I haven’t put any moss around their feet. Your pots looks lovely and complete. .-= Mr. McGregor’s Daughter´s last blog ..The Tale of the Fox and the Squirrel =-. .-= Gail´s last blog ..Musing On Our First Snowfall =-. Your arrangements are beautiful and very much like spring. .-= Nancy Bond´s last blog ..(Un)Happy Groundhog Day! =-. .-= Alexandra´s last blog ..Смородина черная. Особенности выращивания =-. .-= Cool Garden Things´s last blog ..Think First: Pest Control In The Garden =-.